Guess what! 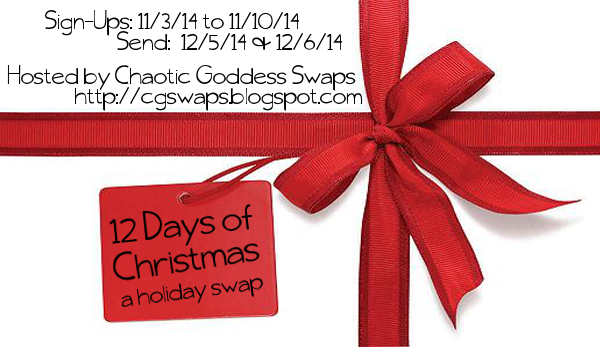 It's time for the next Chaotic Goddess swap! I love swapping with these girls! They run a smooth, efficient, and fun swap. I sat out the Halloween swap because I'm not a big fan of Halloween- besides the candy, I love the candy. But the 12 Days of Christmas swap is great fun! You buy twelve little presents for your partner, wrap each one up, and mail them off. Then when you get your box, you get to open one present a day, for twelve days before Christmas. Last year I was paired up with Aubrey from High Heeled Love. If you want to see what she spoiled me with, the link to the post is here. I'm already looking forward to wondering who I'll get paired with this year! If you blog or vlog, and want to join up, get going! Sign ups are open until November 10!